Dental implant treatment is becoming the new standard for replacing teeth, as it restores quality of life and full dental function. Dr. Martina Reynolds provides this advanced treatment option to those who wish to obtain a rejuvenated smile that lasts. Our Central Park dentist coordinates your dental implant procedure with specialists who place implants, while we complete the restoration portion. Dr. Reynolds believes each patient should enjoy a beautiful smile in full comfort. If you have questions about dental implants or are wondering how you can support your dentures, call us today! 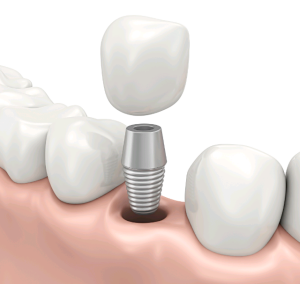 Dental implants provide a new foundation for custom restorations to be attached to. These prosthetics do not slip or lose their fit over time, integrating with the jaw to become replacement tooth roots. Where traditional options only address the visible portion of teeth, dental implants rebuild the entire structure, from root to crown. A single implant supports one tooth, while multiple implants replace entire arches. Patients benefit from improved oral health as well, for integrated implants help the jaw stay strong. Following tooth loss, the jaw loses width and size, resulting in an uneven bite and a sunken facial appearance. Implants stall this process, called resorption, and promote renewed dental structure.Patients need to have enough bone to enable successful implant integration which is why an initial consultation is required before Dr. Reynolds begins treatment. After the consultation, we have patients obtain a 3-D image of their smile, which allows us to understand the health of your bone and where implants should be placed. From there, our in-house periodontist or local oral surgeon perform any grafting procedures which may be necessary before implants are placed. Patients are then given time to heal, which takes a few months depending on the additional procedures that were used. For those who will receive implant-supported dentures, we offer a temporary appliance called VisiClear, which supplies a normal bite until healing is complete. Our Central Park practice offers an array of implant prosthetics to meet your aesthetic needs. Matched according to the number of implants, Dr. Reynolds’ custom restorations have a natural and beautiful appearance. We have worked with the same dental lab for years, ensuring you receive quality results from a trusted source. Porcelain crowns are placed atop individual implant posts, are stain-resistant, and shaded to look the same as your other teeth. We offer full porcelain crowns or porcelain fused to metal crowns. Implant-retained bridges and dentures are fashioned to fit your smile and replace up to an entire arch seamlessly. Anyone who wears dentures may be able to have implants placed and enjoy the full benefits of additional prosthetic support. For a consultation, contact Dr. Martina Reynolds today. We care about the oral health of our patients and restore missing teeth throughout Manhattan, including Central Park, Midtown, and neighborhoods nearby.